The term "Original Newspaper" means just that: it was originally printed on the date that appears on the newspaper's masthead. In other words, they are not reprints or copies.  Paper World guarantees that each newspaper is genuine by providing a Certificate of Authenticity. Also contained on the Certificate of Authenticity are instructions for the care of your Original Newspaper . While the Paper World team use archival methods to reinforce the paper for its protection and preservation, how far in the future the newspaper lasts is ultimately up to you. Generally, newspapers should be kept flat and stored out of the light to minimise the natural degradation that occurs to all newsprint made from wood fibre. Paper World advises that any newspaper more than, say, fifty years old, needs to be handled very carefully. Paper World's selection of Presentation Options also serve as extra protection for your Original Newspaper or Magazines , including hard-back leatherette and traditional folders.